I have been known to risk a few dollars around a poker table, attend the horse races, or make a friendly wager amongst friends, but I do not consider myself a gambler. In real life, I prefer to keep the money I have earned instead of throwing it away. In videogames, however, I will let my money ride. Which explains why I intentionally quit a four hour play session of The Witcher without saving. I approached The Witcher's dice game too eagerly. The game is a variation of Yahtzee - poker played with a set of five dice. Two dice showing the same number is a pair, all five dice showing numbers one through five is a straight, a pair and three-of-a-kind is a full house, etc. After sweeping a set of novice players, I thought I had this game beat. Then I was trounced - thoroughly. I lost everything. While humiliating, this experience has given me some insight. First, do not raise unless you have the winning hand. Second, videogame gambling is an interesting cultural artifact, with its own utility and appeal. The earliest in-game gambling scenario I could find appears in Space Quest: The Sarien Encounter, a DOS game released in 1986 for early home computers. The game features playable slot machines, which may reward you, take your money, or even kill you should the wrong symbols line up (an early indictment of real world gambling?). My own first experience with in-game betting was in 1997 at the Golden Saucer, a casino-like amusement park in Final Fantasy VII. The Golden Saucer includes various games that cost a few GP with potentially significant rewards. 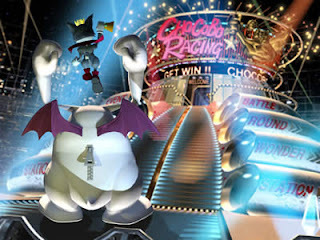 It also includes Chocobo Races, a significant attraction and plot point. 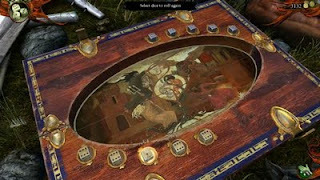 Since these early examples, gambling has been a playable feature in numerous games. Pokemon Red offers slot machines, as does Bioshock - in two very different genres. Fallout 2 features an interactive casino, the Shark Club, and several of the Grand Theft Auto games follow suit. 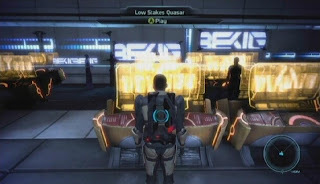 Mass Effect has a slot machine game called Quasar, which is not as fun as Knights of the Old Republic's high-stakes game of Pazaak. Most of the Final Fantasy's have card games for the JRPG playing sort. For a jollier take on gambling, Fable 2 includes a set of Pub Games both in Albion and as an XBLA title - which you can merge with Fable 2 to pad your in-game character's bank account. All of these risk/reward scenarios, while similar to actual games of chance, are interesting because of what they offer to the player in the context of the larger game. Why do actual people gamble their real money? There are a few popular reasons. The first is a simple hope for pay out. There is a chance, albeit a slim one, that a few dollars will miraculously turn into a few hundred. Hope is a strong motivator for the eternally optimistic, especially for low income individuals - those most likely to gamble. Secondly, gambling can be "fun". The social dynamics and ambiance of a casino can be intoxicating (figuratively and literally), and the lights and sounds are strategically designed to satisfy. Lastly, the rush of winning can create a sort of high. The adrenaline associated with risk and win/lose cycles can be exhilarating and physically addicting. Gambling, to some, is a form of thrill seeking akin to bungee-jumping. Yet there is more to videogame gambling than these three reasons. The hope for pay out is present in games, but muted. Gambling mini-games may be slanted against the player. The rewards could also be minuscule compared to those earned by playing the actual game. While these mini-games can be fun (original interactive card games in particular), many are cheap imitations of real life games. Playing slot machines in the middle of Bioshock for example, is ridiculous and more than a little ironic. Lastly, the risk/reward high is significantly diminished when playing with fake money. Surely risking your protagonists life in-game is more adrenaline pumping than risking their artificial cash. 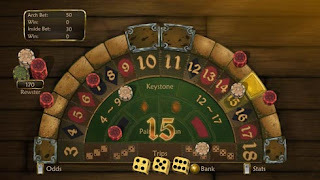 Gambling also has in-game utility for both players and developers. The low risk safety of fictional gambling can offer much needed rest for the weary gamer. The stress of battle or mental fatigue from being lost in Mass Effect's Citadel again can be relieved with a quick game of Quasar. Betting tables can act as optional rest points which reward player-generated pacing. They can also act as a money sink, alternatively giving control of pacing back to the author. Don't want your player overloaded with too much money? Trick them into giving it back with slot machines rigged in your favor. Gambling in a game is just that: a game. I lost my money in The Witcher because I perceived the dice game as a set of rules designed so that I can, and should, win. I bought into the same fallacy that empties the pockets of casino goers. That is where there is confusion in how gambling is implemented. To some extent, I am supposed to win - there is a story that specifically rewards the persistent gambler. But the game is not entirely fair, and will make high-end opponents "luckier". Perhaps I was supposed to return to an earlier save. In this particular case, I blame myself for abandoning the developers design. Despite my fear of losing, there is value in the story of a broke Witcher. Gambling in games could go either way. It could be an interesting addition accompanied by a strong statement. Or, it could be a mini-game afterthought put in to lure away the dollars, gil, and orens of unsuspecting players. For most games, I would guess the latter, but I wouldn't bet on it. Now I am curious. What gambling tables have you enjoyed? Or do you play it safe and not play at all? Mech Warrior: The Crescent Hawks' Inception had a curious function where you could "invest" your money in a stock market of sorts. I consider that gambling. Of course, it was far more akin to a slot machine than a game of poker, since the stock market ran without player input and did its own thing, for better or worse. I managed some "disc one nukes" (early purchase of expensive toys) that way by letting my "investments" balloon to absurd values in the early part of the game, when time isn't a factor. It wasn't a guaranteed thing, and I reloaded a few times, but it was stupidly profitable for no good reason. Considering my considerable distaste for the real world stock market, I have to wonder if that was a sly indictment of the beast, or just a silly little side function a dev slipped in. It didn't reward anything but time and luck, so even if you did manage to become a gazillionaire, it really didn't mean much. You could do as much or more with a hex editor. It's funny that monetary gain isn't always better than just playing the game. Some games have gambling options with very little to buy. I would love to see gambling mini-games act as commentary, but I somehow don't think Mech Warrior was doing that. Now if you COULD effect the stock market, that would be cool too. Destroyed an arms factory in the last mission? Well, weapon upgrades became more expensive, but your stocks are worth more too. I agree that they probably weren't offering it as commentary considering its general irrelevance. Now, using it as a lever to make the world more interesting and give some real consequence for actions, that would be awesome. In my book, BattleTech works best when there is a campaign and previous actions affect new missions. I think much the same could be said of any game that aspires to feel like there is a living world involved, whether or not the player is a major or minor cog in the works. I ended up playing the poker game in "Gun" quite a bit. If I recall correctly, you bet with the same money you could use to buy upgrades and equipment, so it wasn't a totally isolated economy. I also enjoyed it because it fit well with the game's motif: what would the Wild West be without gambling? Even if gambling doesn't have a huge effect on a game's dynamics, it can still strengthen the aesthetics.